Spotcheck is the Industry’s most reliable and widely used penetrant inspection method for the detection of cracks and surface discontinuities in ferrous & non-ferrous test materials. Spotcheck liquid penetrant inspection products are formulated from superior quality dyes and solvents to produce the most dependable and vivid indications possible of surface discontinuities in virtually any non-porous material. The Spotcheck family of products includes a complete line-up of certified penetrants, cleaners, developers and equipment to support your most rigorous NDT inspection needs. Zyglo is the preferred penetrant inspection method for the extremely sensitive fluorescent detection of cracks and surface discontinuities in ferrous & non-ferrous test materials. Zyglo liquid fluorescent penetrant inspection products are formulated from high quality fluorescing dyes and solvents to provide superior indications of extremely small surface discontinuities in virtually any nonporous material. The Zyglo family of products includes an extensive line of certified penetrants, developers, emulsifiers, black lights, equipment and accessories to support your most exacting NDT inspection needs. Magnaflux offers a full line of accessories to help simplify, expand and improve your liquid penetrant inspection process. If you are looking to expand, add to or replace outdated LPI test components and accessories, you will find that Magnaflux carries an impressive line-up of items designed to satisfy your every need. Our accessory offering includes sprayers,test blocks & panels, monitoring devices, timers, and much more. Magnaglo is the preferred fluorescent magnetic particle inspection method used for the detection of fine surface and slightly subsurface discontinuities in ferrous materials. Magnaglo fluorescent particles are finely controlled to ensure maximum sensitivity and to encapsulate and maintain their fluorescent pigmentation for the production of superior indications and to expand bath life. A full family of Magnaglo NDT certified products, accessories and equipment backed by 80 years of industry experience is available to help improve and expand your magnetic particle testing applications. Magnavis is the preferred visible particle inspection method for the detection of fine surface and slightly subsurface discontinuities in ferrous materials. Magnavis magnetic particles are finely controlled to ensure maximum sensitivity and to produce vivid indications under daylight conditions where black light and fluorescent particle use is not possible. A full family of Magnavis NDT certified products, accessories and magnetic yokes is available to help improve and expand your magnetic particle testing capabilities. Magnaflux offers a full line of accessories to help simplify, expand and improve your magnetic particle inspection process. If you are looking to expand, add to or replace outdated MPI test components and accessories, you will find that Magnaflux carries an impressive line-up of items designed to satisfy your every need. Our accessory offering includes coils and prod sets, test blocks, field indicators, monitoring devices, contact plates & pads, and much more. Magnaflux black light technology has been specifically designed to maximize the detection capabilities of your magnetic particle and liquid penetrant inspection process.NDT professionals consistently turn to Magnaflux for top performing, highly durable, easy to use UV black lights. 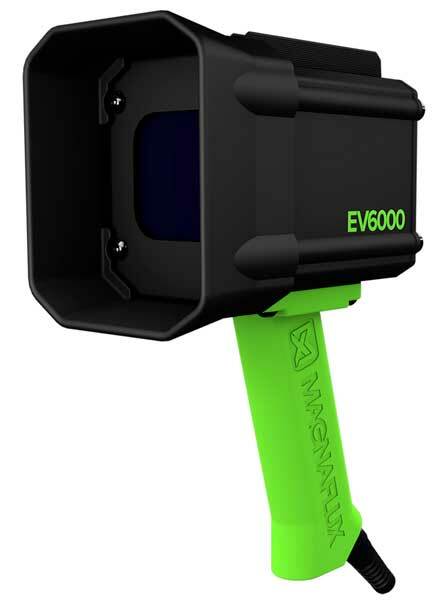 From the new lightweight, ergonomic EV6000 LED UV Lamp, with a nine inch wide beam, no one matches Magnaflux for UV light ingenuity and performance.